Price: The primary reason consumers and builders alike prefer to use laminate flooring is because it is less expensive compared to other floor surfaces (hardwood, tile, stone etc. ), and as a result, laminate flooring is much more accessible to those on a strict budget, or for those that want/need new flooring, but don’t want to break the bank in the process. Durability- Stain and Mold Resistant: Regardless of the price, the old adage “you get what you pay for” comes to mind. A product is not worth the price you pay for it, if it doesn’t last. Laminate flooring, however, does indeed last. It is extremely durable. It is resistant to both staining and mold, and in most cases waterproof as well. Conveniently Sized: Compared to typical hardwood flooring, which is sold in eight to ten feet lengths (sometimes longer); laminate flooring planks are sold in convenient four-foot lengths. And laminate tiles (ranging in typical tile sizes 4 inch, 6inch, 12inch and 24inch) comparing it to ceramic tiles on the usability scale. Easy to Install and Remove: Thanks to the interlocking feature, most laminate floors can be installed in the same day. This is also ideal for circumstances that may require the flooring to be removed- whether it be for a design overhaul, or perhaps new buyers looking for another option. Unlike hardwood that needs to acclimate to the conditions inside a house (sometimes up to six weeks), laminate can be installed within 24-36 hours of purchase. In addition, the flooring can be glued together for a more permanent solution. Versatile Design: Because laminate flooring uses printed designs embossed in resin, almost any design and finish of laminate flooring is available. In addition to emulating typical natural hardwood surfaces, the printing design can also replicate the look of stone, ceramic, bamboo, cork and many more. Easy to Maintain: Thanks to the first protective wear layer, laminate flooring is impervious to a variety of spills and wear and tear (liquids, gum, wax, crayons, make-up, heel marks etc.) making cleaning the floors exceptionally easy. Regularly maintaining the floors couldn’t be easier- sweeping/vacuuming to remove dirt build-up, and wiping up spills as they occur. 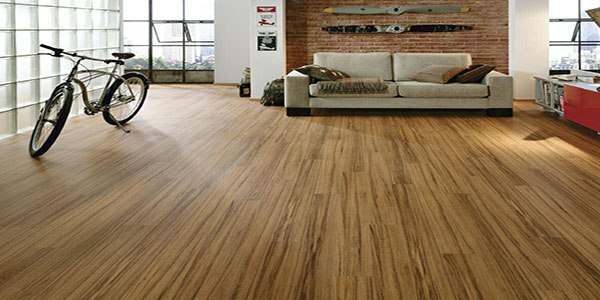 Krono Laminate Flooring- the only elegant solution for long-lasting floors.